Yes. 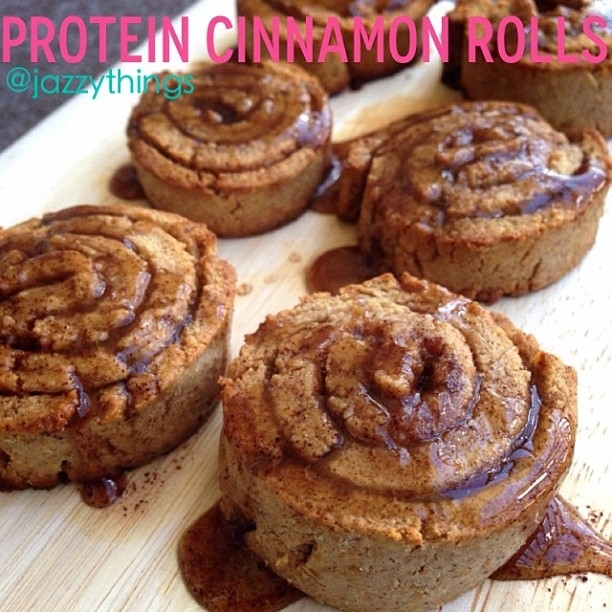 I saw a few cinnamon roll posts floating around so I set out to make a jazzy protein creation of some! Whisk together 3 eggs, 1/4c melted coconut oil, 1t vanilla extract and 1/2c honey. Add 2c whole wheat flour, 1t baking soda, 1t cinnamon, and 2 scoops of cinnamon bun (Dymatize brand) casein protein (use any flavor you want, and yes, you can use whey as well). This dough will be very stiff, but stir stir stir/knead knead knead. Roll the dough (with a rolling pin [actually I used a can because I don't have a rolling pin ha]) between two pieces of wax paper until it is about 1/4 thin (no thicker - it'll be crumbly so if it is too thick, it won't roll). I then cut the dough to make a rectangle so it didn't have jagged edges.